This beautiful 2155 sq ft town home overlooks the Dalton Ranch golf course. Every room has great mountain or golf course views. Enjoy dining alfresco from your personal deck, or entertain in the formal dining room. Each of the three bedrooms has their own bath (all with shower and tub), and there is a powder room near the great room. The Master bedroom is on the ground floor with a cal-king bed and a day bed. Upstairs are two bedrooms. One has a cal-king bed, and the other has two full size beds. The vaulted great room has a gas fireplace and a 65" smart tv. There is also a 55" smart tv in bedroom #2 upstairs. Wi-fi, cable, and a blu-ray player are provided. The home has a 2 car garage, washer and dryer, gas cook top, and a natural gas grill on the deck. The kitchen is fully equipped and has all new (2017) stainless steel Kitchenaid appliances. Down town Durango is 10 minutes south, and Purgatory ski area is 20 minutes north. 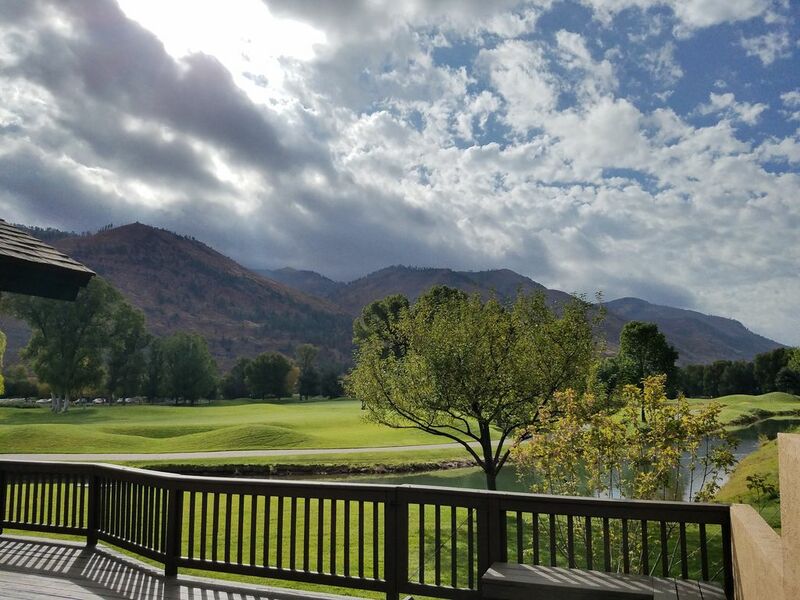 Enjoy golf, hiking, horseback riding, biking, fishing, kayaking, rafting, skiing, cross country skiing, the Durango to Silverton narrow gauge train, and Trimble hot springs. There is a gourmet grocery store, hardware store, and a wine shop just around the corner. Second stay here. Great place and location. Nicely furnished and roomy. The home is great, nice location between town and Purgatory. Very comfortable layout, nicely appointed with beautiful views. Will definitely rent again! We typically don't rent townhomes so renting this one was a new experience and it was a great experience. We love natural light and this rental is an end unit so it has lots of windows on 3 sides of the home with a nice open space between it and the units next to it. Our unit was incredibly quiet. We heard absolutely no noise from the unit attached on one side of the one we rented. There were people in it but we only knew that because there was a vehicle in the driveway. Meaning, to me, that the townhomes are very well built. The deck off the living room and master bedroom backs up to the golf course and the view is even better than the photograph shows. The quality of the furnishings and the well stocked kitchen, appliances/dishes/utensils, is unusual in a rental. We did not have to make a run to the grocery store to buy toilet tissue/hand and bathing soap for the bath rooms, dish washing or laundry soap and paper towels for the kitchen, and Kleenex which was provided in each room of the house. The Kleenex was a big surprise. We usually take some for the living area and bedrooms so having it provided in each and every room was a pleasant and over-the-top surprise. Another surprise was the quality of the silver ware in the kitchen. It was of noticeably really good quality. Some of these items I mentioned are small items but on the whole they helped us thoroughly enjoy our stay in this home. We plan to stay in it again if it's available when we are in the area and if the owner approved of how we left it! The house was well appointed, very spacious and comfortable. The location was great....just minutes out of town toward Purgatory on a golf course with incredible views! The house was clean and very nicely furnished. It is just as pictured, sometimes the houses are a little disappointing after you get there. However, that was the not the case here. I would totally stay there again. Beautiful townhome, beautiful views. Nicely equipped, great kitchen. Owner very responsive to an issue that came up. We would go again.